Definition at line 61 of file DebugInlineeLinesSubsection.h. Definition at line 42 of file DebugInlineeLinesSubsection.cpp. Definition at line 75 of file DebugInlineeLinesSubsection.h. Definition at line 68 of file DebugInlineeLinesSubsection.h. 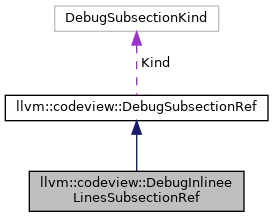 References initialize(), llvm::codeview::InlineeLines, and llvm::codeview::DebugSubsectionRef::kind(). Definition at line 76 of file DebugInlineeLinesSubsection.h. Definition at line 57 of file DebugInlineeLinesSubsection.cpp. Referenced by getFileName(), and initialize(). Definition at line 45 of file DebugInlineeLinesSubsection.cpp. References assert(), llvm::BinaryStreamReader::bytesRemaining(), llvm::codeview::EC, hasExtraFiles(), llvm::BinaryStreamReader::readArray(), llvm::BinaryStreamReader::readEnum(), and llvm::Error::success().